Hello everyone. I've been away for a long time now, but all it took was one great production and my Cats passion is back. Cats opened in May in Toronto, and is running until the end of August. This is the first time Cats has called Toronto home since the original production in 1985, so it's the first professional production I've seen that was not a Troika tour. The Toronto theatre community and the newspapers seem really excited about the show. There are even two cast members returning from the original production. Coricopat and Tantomile were in the tribe. I don't think they ever appear in Troika shows. Victoria had an expanded role. She sang Sillabub's parts in Memory and was Mistoffelees' assistant during his song. Gus spent more time on stage. He helped welcome Grizabella back and sang during The Ad-dressing of Cats. Rum Tum Tugger ran out into the audience, danced with a couple of girls and stole a handbag from one. Growltiger's Last Stand ended immediately after the aria segment. The Siamese threat was removed entirely. I guess that's a little more sensitive. The sun rose during Memory. Daylight slowly spread across the stage as Grizabella was singing and it was a bright, clear morning as she was welcomed by the Jellicles. It was lovely. 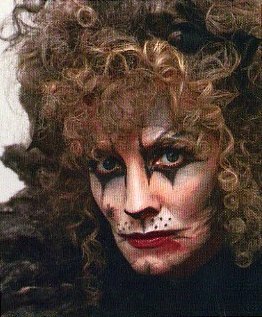 However, Mistoffelees still brought the stars back for Grizabella's trip to the Heaviside Layer and the finale. He formed a 'moon' in his hands (a tight spotlight) and threw it up into the air to bring back the night. I'm barely scratching the surface. I could go on and on about all the changes, large and small, that I loved, and about all the classic moments that I have always adored. I have learned so much about the original London and Broadway productions, I know the video so intimately, that the last time I saw a Troika show it was almost a little depressing. Is that all that's left? So I'm just so glad to have seen this new production. The tickets are a little expensive, but the theatre is only a few blocks from my apartment and I've just learned about rush tickets for the first time, so it's safe to say I'll be going back at least once more. I'll probably add a few more observations then. http://catsto1-px.rtrk.ca has some information and some excellent pictures. Wow, that's a solid 90%! I'm a little confused; is this a permanent production or will it tour all over Canada? I really wish there was some footage/pictures of the sun coming up. Now that is different! As I said, it's in Toronto until at least the end of August. No word yet on what might happen after that. The Toronto 1985 production went on a national tour afterwards, so there is a precedent at least. I've seen these posted in other MdN threads, but I'll drop them here for completion's sake. Unfortunately not complete, but pretty good quality! Now that I've seen this production a few more times, I should add a few more observations. There were a few minor costume changes! When the show opened, Bombalurina and Demeter had very similar costumes in the same bright yellow/orange colour. It really made them look like sisters, I appreciated that little detail. However, recently Bombalurina has switched to her familiar video-style red and black. Munkustrap actually changed in the opposite direction. Originally he had the familiar grey and black look. Now, his wig, makeup, leg and arm warmers are still grey, but the bodysuit is a dark orange everywhere except his upper chest. It's very unique, to say the least! His wig shape changed a little too, it now has two inward-pointing curls up top (sort of like devil horns) that make him look very dignified. I wish I could find a way to pass on some photos! Olden-days forum regular Reeza came to visit me for a week and we had front-row tickets for a Friday night. That was pretty special. There's also a lovely large-size programme with lots of nice photos (of the early costumes), which I could scan if there's any interest. The show has also been extended until September 22nd, so there's still time if anyone wants to join me! I wonder what the thinking was behind making Mistofelees orange ....interesting nonetheless. This "Memory" seemed a little on the weak side to me, was the belt louder in person? Sometimes it's hard to tell with audio clips. Bustophen, that sounds great! I wish I could get up to see it, I've missed so many regional CATS productions this year. Most of them were going on this summer on the East Coast. Nothing here on the West until next Spring. At least I'll have 2, La Mirada and San Diego. Will definitely see them quite a few times. Would love to see the pics from that program.